Dimensions: Teacup Holder: 2 3/4" x 1 1/3" diameter (at base); Teapot Holder: 3" x 1 1/3" diameter (at base); Card: 1 1/2" x 2 1/2"
Each set of these charming "Tea Time Whimsy" place card holders includes three (3) teapot and three (3) teacup-shaped resin bases with gold foil accents, and six (6) coordinating (blank) place cards with a pink floral design on a white background. 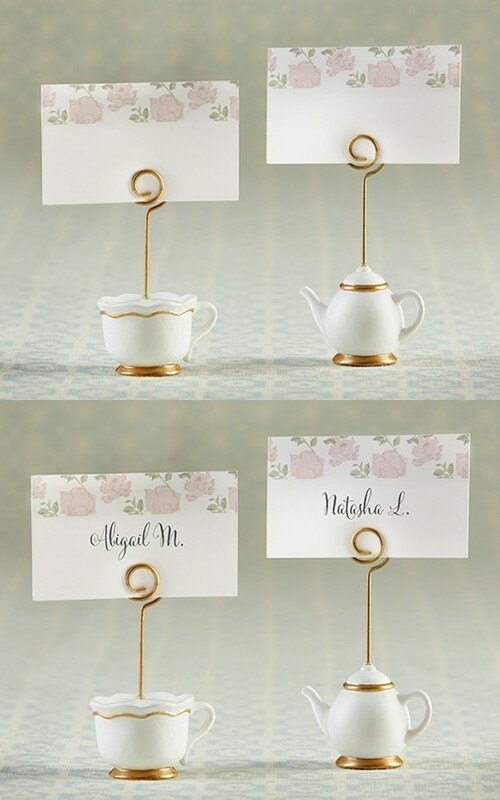 Metal spiral stems hold the place cards securely in place. PLEASE NOTE: Non-personalized (the pictured calligraphy is an example of what you can write on the place cards). PLEASE NOTE: Sold as a set of six (6) and prices quoted below are per set.